Chinook Trekker Snowshoes Review - Best Budget Snowshoes! Chinook is probably not very popular as a snowshoe maker but the company does have a nice offering. Coming with some basic functional features, Chinook Trekker snowshoe is likely to be the second best budget snowshoe after MSR Evo. There’s nothing too technical about it but there’s nothing too disappointing too. All of its elements are geared to function well on beginners terrain and groomed trails. Lightweight aluminum frames, durable plastic decks, plain webbing strap bindings, and a set of aluminum crampons. They’re not superior in any way but good enough to keep you sure footed on any rolling hills. Chinook Trekker snowshoe has that common oval shaped frames made of aluminum. The length varies from 19-inch all the way to 36-inch, with the width following. The smallest one is perfect for children, capable of holding total weight of 90-pound. If you’re going to buy it for yourself, I recommend getting the 25-inch or 30-inch version. They should be good enough for people of average weight. If you’re on the heavier side, however, or want to blaze your own trail through deep powder, the oversized 36-inch snowshoe work best for you. The decks are made entirely of plastic. It does make some cheap sounds as you walk on hard pack but it’s very sturdy. Its durability is on par with that of premium snowshoes from leading brands. Flotation is adequate at its best but you have to keep in mind the terrain condition in mind. You can’t expect a 22-inch snowshoe to keep you afloat in powdery situations. So, again, choose your size carefully. 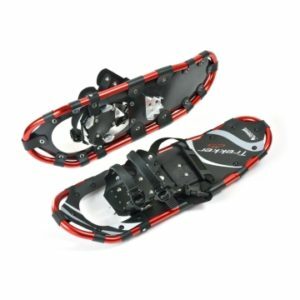 Intended for beginners, Chinook Trekker snowshoes feature a moderate traction system. There are two sets of crampons, all of which are constructed of aluminum: one is located under the balls of your feet and the other is fixed under your heels. Despite the gear’s affordability, they do dig into the hard crusty snow, providing you with better stability on uphill and downhill walks. However, it’s not equipped with any lateral crampons on each side of the frame. Side stepping across a slope with this snowshoe will be a bit trickier. One last note, remember that the crampons are not of solid stainless steel. They’re made of aluminum which is less rugged. So, pay attention to where you step. You don’t want to hit a rock and find the spikes bent all over, reducing the traction by much. 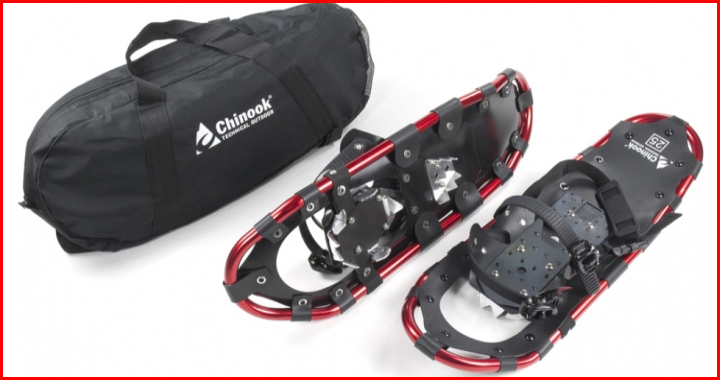 Chinook Trekker snowshoe uses two straps with ratchet buckles to secure your arch. They’re very easy to adjust. Just click the buckle and pull the straps. Meanwhile, the heel strap at the back can be released quickly, thanks to the clip-in buckle. All of these are connected to the decks using a flexible webbing strap. This rubber-like strap limits your feet motion as you walk but they’re handy should you want to increase your pace or even run. In short, when it comes to ease of use, this snowshoe is top notch which is all the more reason it’s perfect for beginners. As of the security, the straps will remain tight as long as you stay on the trail. The story could be different, though, if you wear this snowshoe on technical terrains where your feet will often be turned and twisted. After all, Chinook Trekker snowshoe only has two straps, instead of three, to cover your arch. It’s definitely not designed for backcountry exploration. You should only use it for recreational trekking in your favorite ski resorts or national parks. Still not convinced? Find out how Chinook Trekker snowshoes fare compared to other snowshoes in our list Top 10 Best Snowshoes of 2017.
where are chinook snowshoes made?